It feels like everyone's been to Burrissimo lately but me. What's all the buzz? You're going to take the build-your-own concept and put it in with Italian food? Well that sounds good to me. Italian used to be my favorite before I started realizing I could (generally) cook a lot of it myself. However, it's still great to have it every once in a while when I get a craving but don't have ALL of the ingredients. Besides, I still love all the types of veggies used in Italian food. Burrissimo became a lunching spot for some friends I was catching up with, and it sure did fill us up! When you stick the word "fresh" in your name, you better be sure of it. 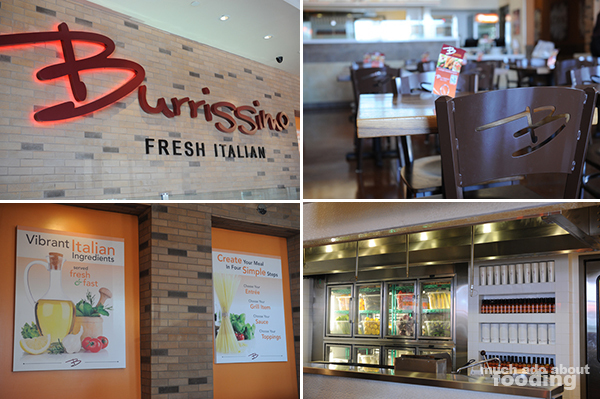 I think Burrissimo took it to heart because their display of toppings, sauces, soups, and breads was excellent. The countertops were easy to see behind glass coverings, and looking even further back, you could see the huge, neat bins of beautiful produce. Walking in, there are signs to explain what to do as well as paper menus up front. 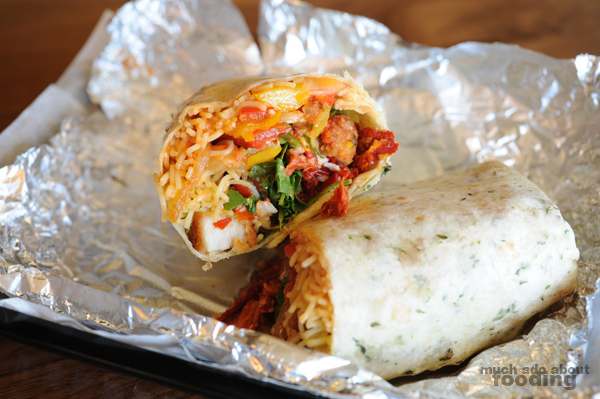 You basically have a choice of getting a Burrissimo (angel hair pasta, grill item, fresh vegetables & sauce wrapped in organic Italian flatbread), Pasta Bowl (angel hair pasta, grill item, fresh vegetables & sauce), or Chopped Salad Bowl (Romaine & mixed greens, grill item, fresh vegetables & dressing). Grilled items will determine the final price of your meal though the price range is only $6.49-7.99. Items included Vegetarian, Chicken, Crispy Chicken, Meatballs, Steak, and Salmon. Good array! Sauces are either warm or cold depending on the type of entree you were getting. 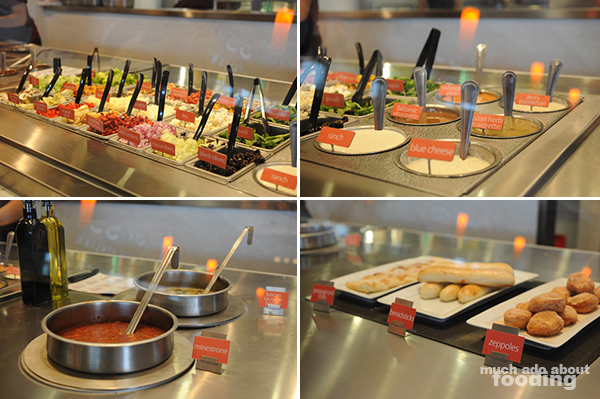 They are: Pomodoro, Diavolo, Alfredo, Red Pepper Pesto, Zesty Parmesan, and five Salad Dressings. If we really must get into the gorgeous and clean trays of toppings you could choose from, this post would run long but some key items of note were their freshly shaved Parmesan, peppadew peppers, sundried tomatoes, Italian corn, ratatouille, and even roasted garlic. Talk about taking care of the customer! You'll have to visit yourself to see what else there was. Our service was very accommodating and friendly throughout. The sodas are fairly straightforward and standard until you reach the Italian sodas of which you can opt for pomegranate, strawberry cream, and wild grape. I tried the pomegranate and wild grape but found both a little on the sweet side with plenty of artificial coloring. My cup was stained by the grape! Another Burrissimo-branded product that was marked there was their hot sauce which really did have a kick to it but didn't strike me as too memorable in flavor. With two other friends present, I waited until they had made their picks before going for the last of three options. That way, we could all see how the different entrees worked. My friend's pasta bowl was quite large and heavy, and she stacked hers with meatballs, corn, olives, pomodoro sauce, and a few more I can't recall. I had a bite, and it was generally okay. 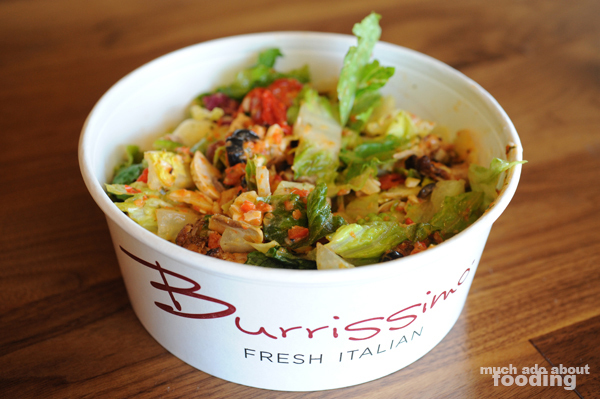 Considering that Burrissimo is a fast casual joint, I'd say the freshness was great. My order was a salad with grilled chicken (lemon, rosemary, & garlic) topped with peppadew peppers, olives, mushrooms, artichoke hearts, and their red pepper pesto (apparently their most popular). I really enjoyed the dressing and the peppadew peppers! However, perhaps they could have eased up on it a little bit because by the end, my lettuce was soggy. Additionally, it seemed difficult to find my chicken's flavor underneath the slew of pesto. 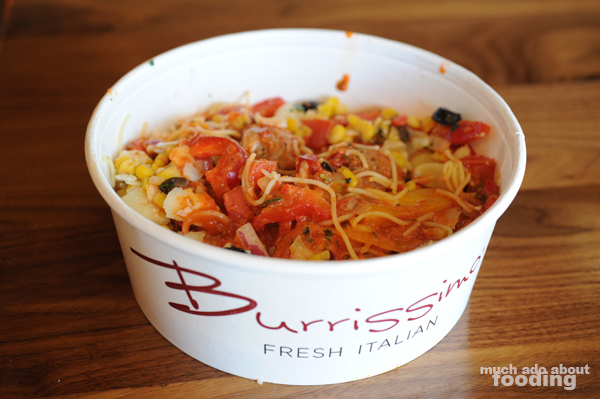 My friend ordered the Burrissimo with heapings of ratatouille, diavolo sauce, and crispy chicken. I took a bite from this. The flatbread was pretty nice and subtly herbed. 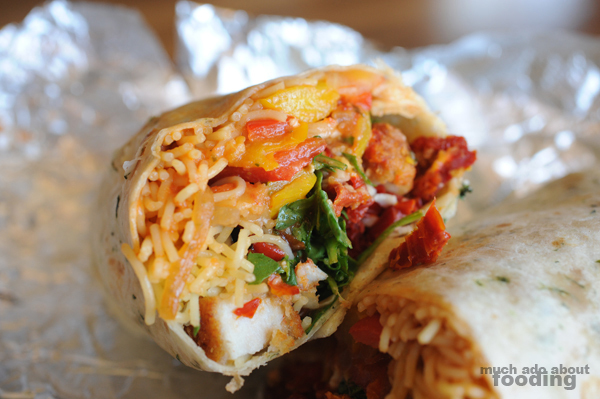 I liked the chicken in this wrap but don't know how it would hold up without any sauces with it. The vegetables were fresh and bright inside. Just for good measure, I also got their Zeppoles which are Italian doughnuts with raspberry dipping sauce and vanilla icing. 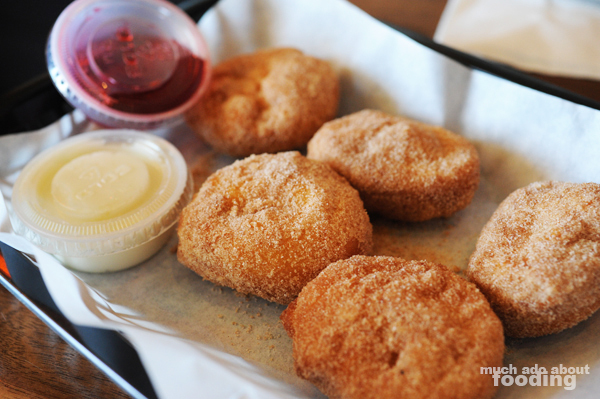 These were heavily dusted with cinnamon sugar (maybe a bit too much?) but very well made inside in terms of dough. I enjoyed the inner dough more than the coating and definitely in the raspberry over the vanilla. I think if you're interested in getting these but are not completely sure, you ought to look for deals such as their in-store promo from June 24-30 this year which will give you a free order of zeppoles with a $7 minimum purchase (easy peasy with the price range of the food!). Overall, a decent meal for its price range with plenty of fresh ingredients and variety of vegetables; the service and staff there were excellent. I'd probably stick with the pasta bowl or salad bowl if you want to stay on the lighter side. Enter through the Rafflecopter widget for your chance to win! The giveaway will run until 6/25/13 at 11:59pm PST. A winner will be contacted upon winning and has 48 hours to respond before another winner is drawn. 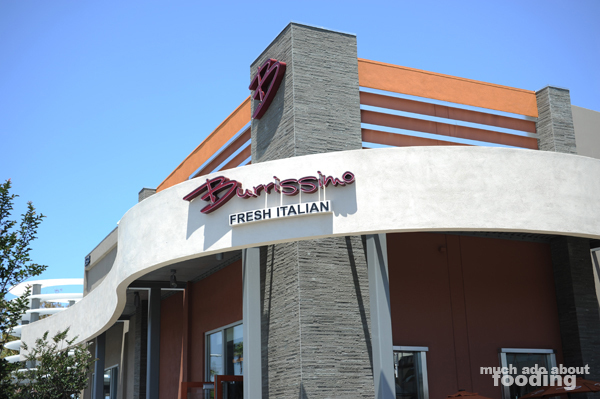 Runner-ups for the giveaway will be awarded a $10 gift card to try Burrissimo out. 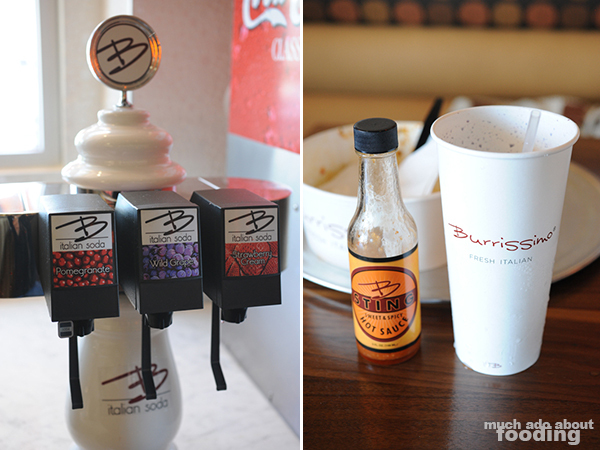 I would try the Burrisimo. Oh the Burrisimo for sure! !